The four public tasting sessions will take place at the Colorado Convention Center 14th and Champa Streets in downtown Denver, Colorado. The Great American Beer Festival ices, taps and pressurizes all draught beers sent in Sankey kegs. The majority of breweries take advantage of our tapping service. If you choose to tap the beers yourself, please provide all equipment necessary (faucets, taps, lines, CO2, etc.). The GABF provides keg containers and ice. All beer entered in the festival must be delivered to the GABF host distributor for legal and inventory purposes. 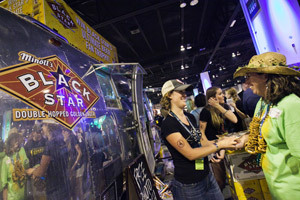 Festival beer received by the host distributor becomes the property of the host distributor for GABF and may not be used for any other purpose such as selling at retail. The GABF only accepts kegs in stainless steel or single use plastic kegs. Kegged beer sent in any other format will not be served at the festival. The festival is not able to accommodate any Hoff-Stevens, Golden Gate, Cornelius kegs. Each brewery or brewing company is provided a 6 ft. table (6 ft. wide x 24 in. deep x 30 in. high) with an 8 ft. high drape located directly behind the table for brewery displays. While booths are 10 ft. deep, the back 2 to 3 ft. of the booth are used for keg and draught system storage and should be unencumbered so that our beer service crew has easy access for delivering, changing and servicing kegs & draught systems. Electricity is not provided or available in standard festival booths, only in sponsored endcap booths. Brewery Booth Signage: All brewery festival booths are pro- vided with a 47 in. wide x 23 in. high brewery sign that contains their brewery name, location, booth number, beers being served, and ownership info (if 25% or more owned by another brewery). This banner must be visible at all times during the festival, but feel free to dress it up with your own signage as well! Electricity is not provided or available in standard, in-line festival booths, only in sponsored endcap booths. Good Neighbor Rule: anything that impedes traffic flow in the nearby area or encroaches on your neighbor’s booth is not allowed. Please be conscious and respectful of your neighbors’ space. All banners or back wall displays should be less than 6 ft. wide. Displays wider this will need to be adjusted to fit the booth space. Brewery displays may not restrict the flow of traffic behind the booth. This includes cords, bars, or other tripping hazards. GABF beer service team and volunteers use this area to access all booths. All displays must be behind the front of the booth and may not extend into the aisles. The height limit for all booths is 15 ft. No overhead hanging signs unless approved by GABF organizers 30 days prior to the event. 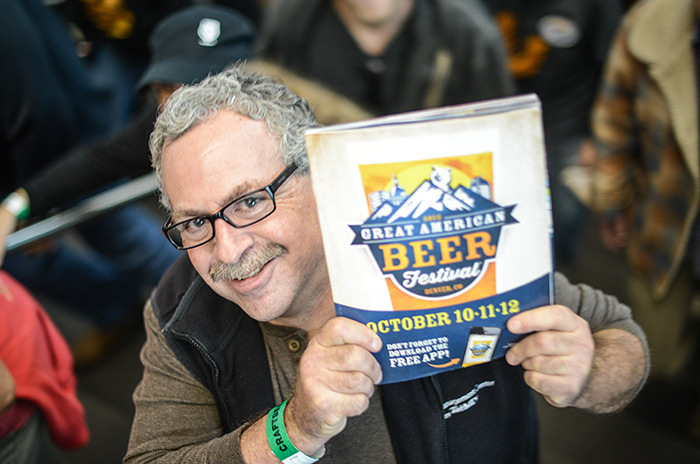 The GABF is intended to educate consumers about the quality and diversity of beer in the U.S. The GABF may, at its sole discretion, request and/or require the removal of any inappropriate displays. Tents larger than 6 ft. wide or 8 ft. deep that encroach on your neighbors’ space are not allowed. Tents that stay in your designated area (6 ft. wide) are allowed. The GABF is not responsible for lost or stolen items. Take important and valuable items with you when you leave each night. GABF Provides each brewery with a banner listing the brewery name and beers being poured. This banner must be visible during the festival. Complimentary promotional items (with the exception of coasters, which are prohibited) may be distributed to attendees but should not be thrown from the booth. No smoke machines (the convention center does not allow them). Stickers: the cost of removing brewery labels and stickers found on Colorado Convention Center windows, mirrors, or other surfaces will be charged directly to the brewery. The GABF invites all breweries to decorate their booth and win a prize for the brewery booth with the most festival air. We ask breweries to turn on their festive spirit and craft the most creative booth in the festival hall. The booth with the most festival flair is awarded a plaque at the awards ceremony and a certificate for complimentary competition (up to 4 or 5, whatever the maximum is for that year) entries for the next year’s GABF. There is an award for best end-cap booth and best in-line booth. Breweries must bring all of their items to decorate; these cannot be shipped to the Convention Center or with festival beers. We suggest shipping your decorations to your hotel room or bringing them by car. Each year, designated drivers have the ability to enjoy some non-alcoholic craft brewed products. If your brewery makes non-alcoholic root beers or sodas, we would appreciate your donation to the designated driver lounge. Email Chris Williams at williams@brewersassociation.org to donate non-alcoholic beverages. Attendees receive an official GABF program containing information about the festival as well as your brewery information. Your information includes: brewery name, city, state, website, booth number, and your beers at the festival. If your brewery is 25% or more owned by another brewery, that information is also be listed in the program. Your brewery has a booth space 6 ft. long x 10 ft. deep. If you submit draught beer to the tasting, kegs are tapped at the back of your booth space. Bottles and cans are iced in tubs and placed on a table at the front of your booth. Promotional items and pitchers of water for rinsing tasting glasses are placed on the table. A GABF sign, including the name and location of your brewery and the names of beers you are serving hangs from the 8′ high drape on the back wall of your booth. Festival attendees receive a tasting glass and a festival program when they enter. 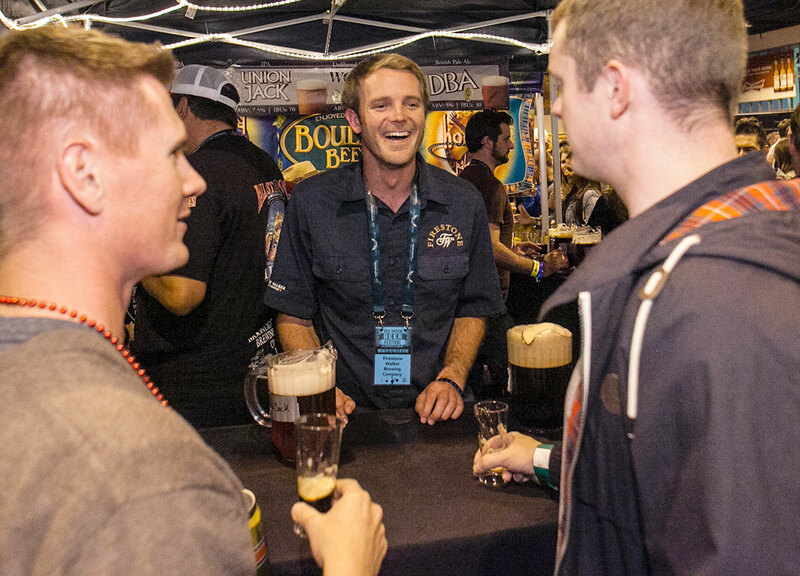 Each evening more than 10,000 attendees circulate among the booths tasting various beers. You, your brewery representative, or one of our knowledgeable volunteers will pour one-ounce servings and answer questions. Participating breweries are expected to staff their booth at all times, as many of the festival attendees want to learn more about your beer. 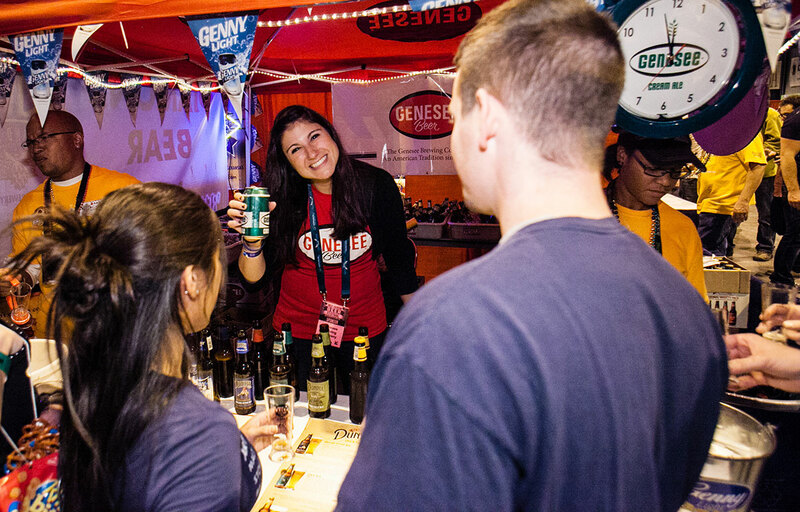 Remember – festival attendees want to learn more about YOUR beer, and meet you! *PLEASE ASSIGN A BREWERY REP TO POUR YOUR BEERS AT ALL SESSIONS. A valid photo ID is required to pick up any badge. Individuals who’s names have been associated with a specific badge will be allowed to pick up only their one badge. If you have a ticket to the Brewers Gathering, this is printed directly on your badge. You will need to pick up your badge prior to 7:00 pm on Wednesday in order to attend the Brewers Gathering. Check-in closes at 8:00 pm on Saturday night. Badge not picked up by that time will not be available for pickup after 8:00 pm on Saturday night. As part of the brewery registration fee, each brewery may designate up to four representatives (depending on the number of beers entered) who may promote and distribute its products at the brewery booth. The Brewers Association is dedicated to presenting GABF beers in a favorable light. Part of this plan is to provide a safe and secure environment. Make sure that your brewery representatives are aware of and adhere to the ONE-OUNCE POUR RULE. Festival breweries (i.e. those with a booth at the festival) may purchase a maximum of four additional brewery representative badges valid for all sessions, based on availability. The cost is $185 per additional pass for Brewers Association members. Additionally purchased badges do not include access to the Brewers Gathering. Competition-only breweries (i.e. those only participating in the competition) may purchase a maximum of four brewery representative badges valid for all sessions, based on availability. The cost is $300 per additional pass for Brewers Association members, $325 per additional pass for non-members. These badges do not include access to the Brewers Gathering. Badges are good for all four sessions of the festival. Each badge has the brewery’s name on it and should be used by brewery representatives only. Each badge is good for one person to enter the festival per session. All badges are the property of the Brewers Association and may be revoked at any time. All brewery representatives are ID’d and wristbanded each day. Please plan accordingly and allow time to get wristbanded and ID’d onsite before entering the hall. Ages 21+ only. As part of our mission to educate the consumer about the quality and diversity of beer, the expectation is that breweries will have at least one brewery representative present in their booth at all times during the public sessions. 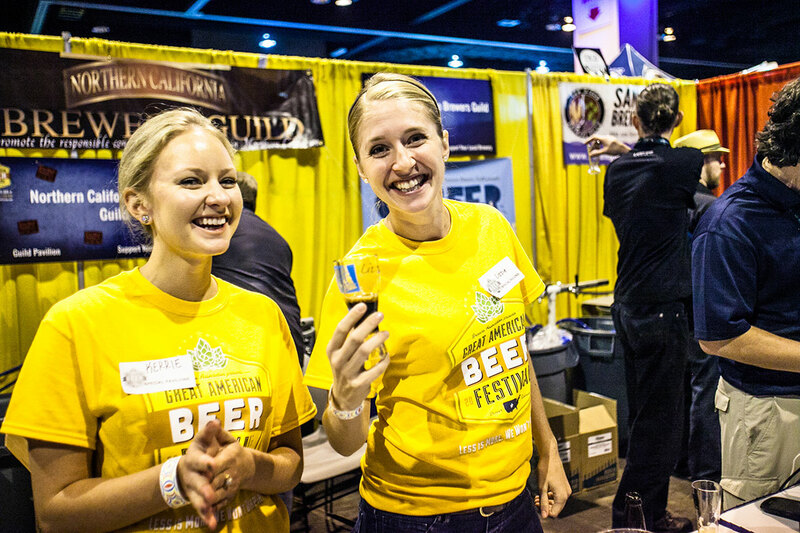 The GABF will continue to staff booths with volunteers who are educated about beer styles and the brewing process to assist brewery representatives. All brewery representatives must be 21 years or older and present valid photo ID upon check-in at the festival. Please plan accordingly and allow time to get wristbanded and ID’d onsite before entering the hall. Ages 21+ only. No exceptions. Promotion of your product may only occur within the confines of your booth. Brewery representatives must maintain sobriety while attending the festival. Any brewery representative deemed intoxicated during the festival shall be subject to ejection. Brewery representatives must be appropriately clothed during the festival. Appropriate dress is at the sole discretion of the GABF. Brewery representatives should conduct themselves with appropriate decorum at all times. Activities by a brewery representative that endanger festival attendees, festival staff or festival vendors, or any activity which is contrary to Colorado law may subject the brewery representative or the attending brewery to ejection from the festival at the sole discretion of GABF staff. Throwing items (i.e., shirts, cups, coasters, etc.) from the booth into the crowd is strictly prohibited. Coasters are not allowed at the festival. Please do not bring them. “Flying coasters” have posed safety issues at previous events and are now prohibited. Pour only one ounce of beer into attendees’ glasses. There is a pour line on the glass for your convenience. Please do not serve attendees who appear intoxicated. Alert GABF staff or security personnel if needed. Beer shall be served only from behind the tables in the booth space. Please make sure all of your brewery representatives adhere to these guidelines. Failure to do so will result in warnings and/or expulsion of your brewery or representatives. Consider the “Meet the Brewer” hall, where festival booths will be staffed ONLY with brewers and brewery owners. Several of our educational pavilions also move to this hall and an additional public entrance to the festival will be located here. During the application process (June 19 – June 26) breweries must first“opt-in” to the lottery for a festival booth space (only open to BA Member Breweries). Brewers may also “opt-in” to participate in a “Meet the Brewer” booth in the GABF Festival hall. Participation is limited. DIY Staffing! – Brewery booths in the “Meet the Brewer” hall must be entirely staffed by brewers, brewery owners, and other brewery staff. NO VOLUNTEER POURERS WILL BE PROVIDED. Volunteer captains will be assigned to assist with beer service operations, but volunteer pourers will not be assigned to these booths. Spread out! – Each brewery in this section will receive an 8 ft x 10 ft space (vs. the 6 ft x 10 ft spaces in other areas). Breweries will be arranged alphabetically rather than by geographic region. Load in: 10:00am – 4:00pm on Thursday, September 20 for all in-line (non-endcap/sponsor) breweries. Load Out: Saturday 10:00pm – 11:30pm | Sunday 8:00am – 10:30am see below for details. Bringing smaller items? If you are bringing smaller items like banners, small boxes, promotional materials, etc. with you to the festival (anything you can hand carry in one trip) can be carried in through the Brewers Registration entrance and avoid the car/truck lines. Dock Access – For Breweries Bringing Lots of Stuff, structures, etc. For those of you familiar with the convention center, the right side of this map is the Champa Street side, the left side is Welton Street, top is Speer Blvd, and bottom is 14th Street. Each loading dock will have a dock shack/guard at the entrance. Check in with them and let them know you are dropping of for the GABF and they’ll put you in the queue to load in. Plan ahead and don’t show up at the last minute as load in on Thursday can get backed up and you may have to experience a wait to access the convention center. All cars/trucks must be off the docks by 11:45 pm on Saturday night / 11:45 am on Sunday Morning. Prep before you get to the dock: Collect all of your booth materials at your booth space before bringing your car to the dock. Cars/Trucks will not be allowed to sit at the dock while you pack up your booth materials at your booth – have this done before you bring your vehicle. Load out starts immediately after the festival ends on Saturday night – DO NOT LEAVE IMPORTANT ITEMS IN YOUR BOOTH SPACE ON SATURDAY NIGHT – volunteers tear the festival down quickly after it ends, and items left in booths have a tendency to disappear or get lost.